Add a curvy couch in your living room for a soft sleek appeal. 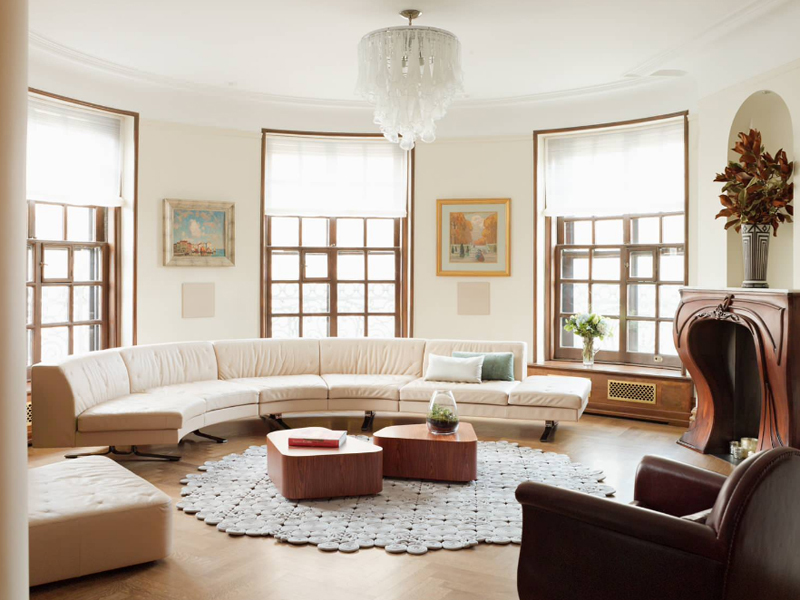 Oftentimes, we put regular-shaped couches or sofa sets in our living rooms. Sometimes, we want long sectional couches or depending on the floor space of our living areas, we may opt for short couches. Nevertheless, couches in one way or another make a living room, well, a living room. It is basically a staple in the home especially in the living room. The couch is a spot at home where conversations are perfect and basically, relaxation is easy and comfort is just a “seat” away. Since common couches in the living room are usually regularly shaped, we have listed in this collection 20 curved-shaped couches if you are thinking of other ways of designing your respective living rooms. 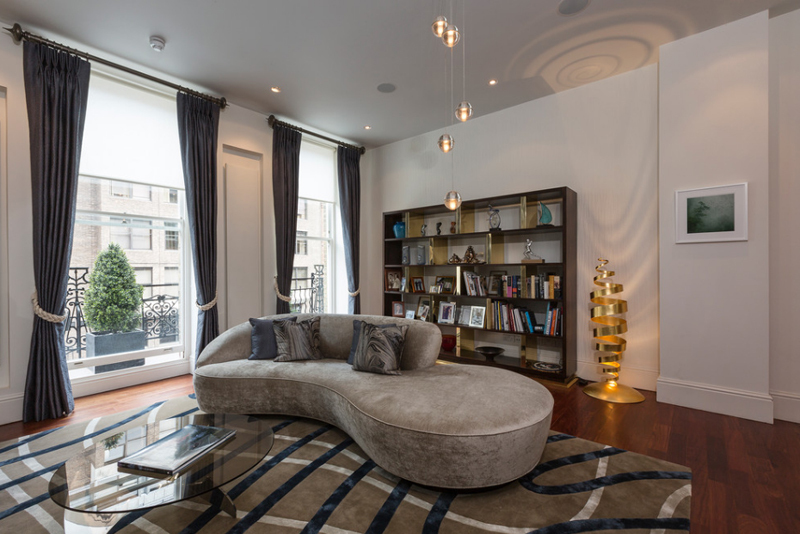 Curve shapes are usually associated with creativity and these living rooms are no exception. 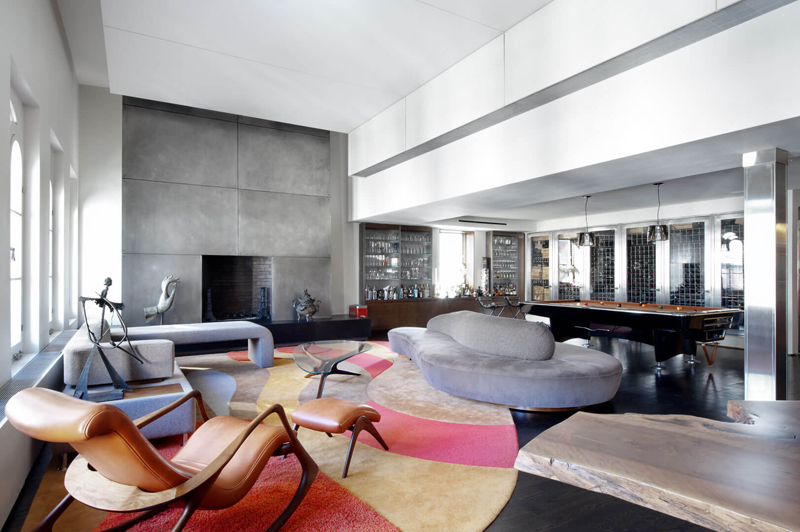 These areas show how creativity is evident or even emphasized once curved couches are used. Well, this first curved couch sure looks incredibly long and pretty. I know that it’s beige and all, but it somehow looks a little pink and that’s probably the reason why it looks so pretty. The coffee tables in the middle of the room sure is unique and wonderful, I think it’s really perfect. A white house is something that even when I think much about it, I would not really want to have because of how hard it is to maintain. Nonetheless, a white house is a great base for something you can create much of and make something into your dream home. Take for example this house, there are tons of possibilities and I’m sure there’s always a new project waiting to happen. This living room sure seems to lack seating. Since there is still a lot of space on the side of the plant – you know that there is something more that one can do with and for this house. The color combination seems easy to play around with too, so it’s a plus point. This manor sure is something nice and classy – the furniture choice is something a lot of people would want for their home; maybe not the exact pieces of furniture of course, but somehow similar if they want to achieve much in making a lot of seating in a small space. The materials used for this home – especially the color combination is something I would not consider suggesting to friends; don’t get me wrong, I love brown and every earth color available but since they used a couple of darker browns, it made this space seem aloof – the use of lighter browns or beiges could have been prettier and calmer. Seen this living room design before? I love how stunning and appealing this color combo is – it seems like it’s inviting you to actually get closer to it and chill. 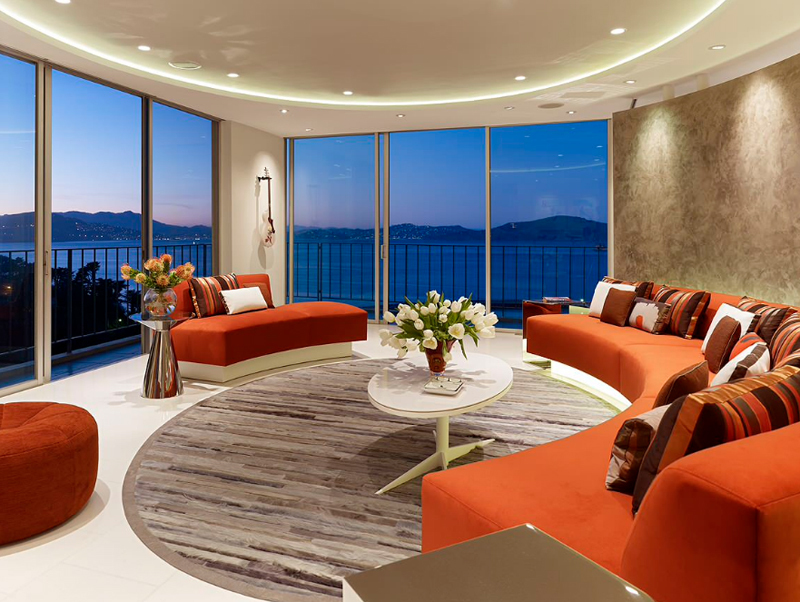 The circular designed living room is far more interesting than the fact that the seating is actually specially done for this wonderful penthouse. What a glamorous living space! You and I know that in most spaces of the house, it’s the furniture that somehow dictate how another person would actually perceive what your space is – fancy or not, glamorous or not, charming or tacky. In this case, we see glamorous furniture and then we tagged the space as is. Check out the portion of the carpet wherein we are able to see the details – pretty awesome right? The protruding portions in blue sure looks fun and exciting. The play of colors is really charming and not too loud which means that anyone could really relax and chill while there are in this living room. These curves are lovely and the color choices made are superb. These may remind you of the yin and yang which basically promotes balance. Our lives require balance and one good way to start it is at home. 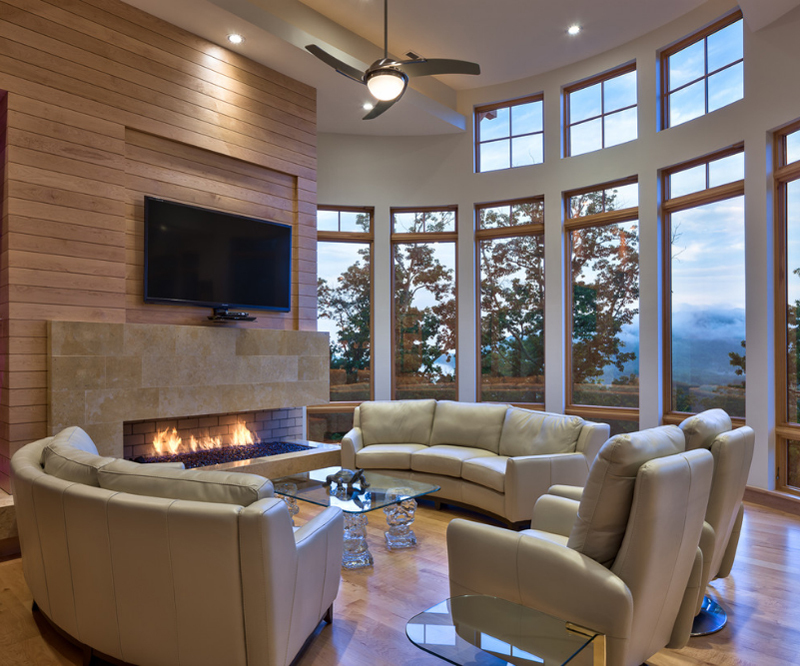 This living room, along with the gorgeous view outside show a perfect balance both in aesthetics as well as in practicality of purpose. 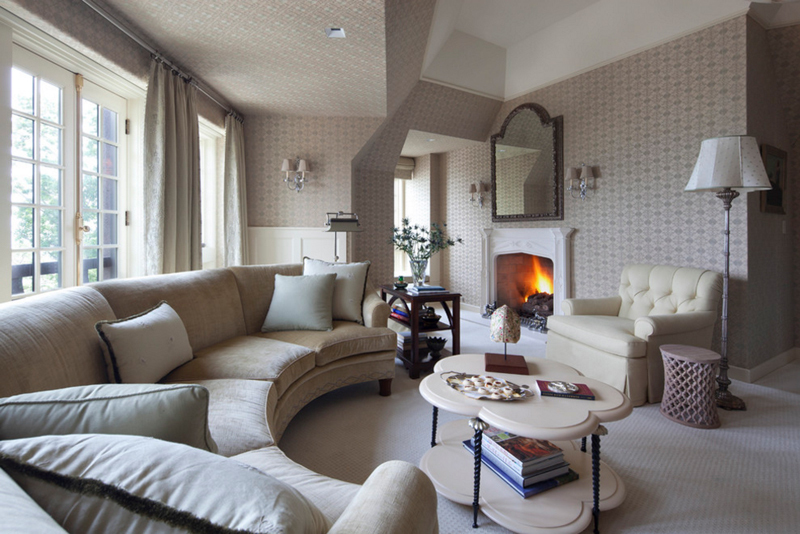 The area is not huge but fret not, there are curved couches that are perfect for small living rooms like this townhouse. If your living room is similar to this, you will see that tall shelves and cabinets are perfect for those decors and books to maximize space. Light colors like the beiges and off whites are also perfect for small spaces. 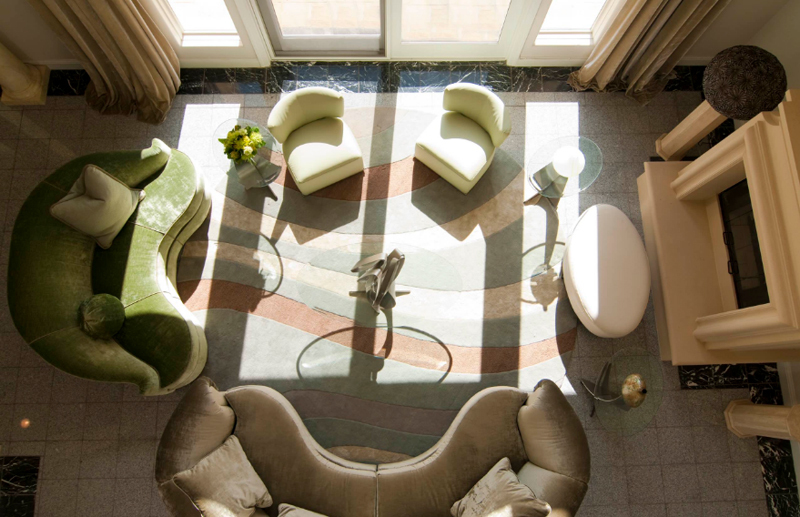 Here’s a top view of a living room with curved couches. The materials used are of a cool shade and somehow seems velvet. 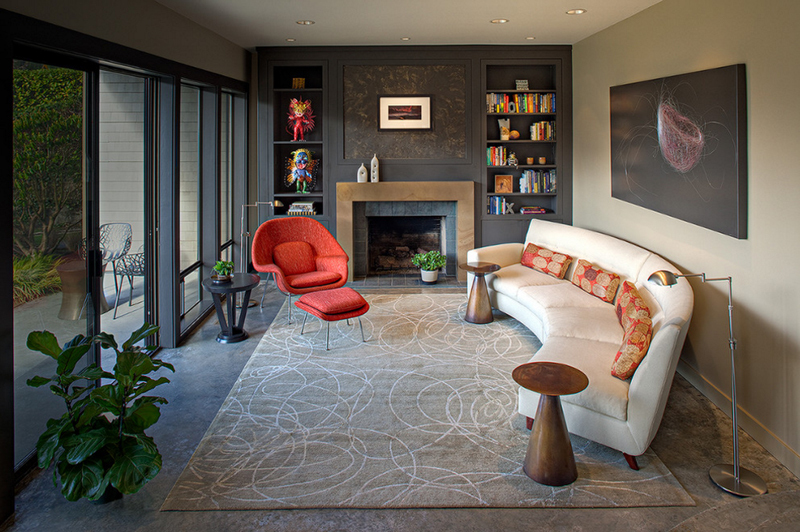 Great carpeting like in this living room definitely adds a boost to your simple living room. Glass for coffee tables are a nice classy feel to your living room as well. This living room is absolutely dainty. The beige curved couch perfectly matches the colors of the wall and the curtain. There are various decorations in this living room that resembles some sort of balance to the entire look. Take for example the two horse images, two bust sculptures, two wooden chairs, and even two peacock-designed throw pillows. Pairs are a good way of decorating the home indeed. The tufted design on the curved couch is perfect for a material like velvet, and the shiny and distinct effect by velvet is perfectly complemented by grand and extravagant decors like the chandelier, the golden palm chair, and the vases and those fancy additions in the room. Overall, this living room is magnificent and deluxe. This home by the coast has a top notch view and those window are perfect for a home like this one. 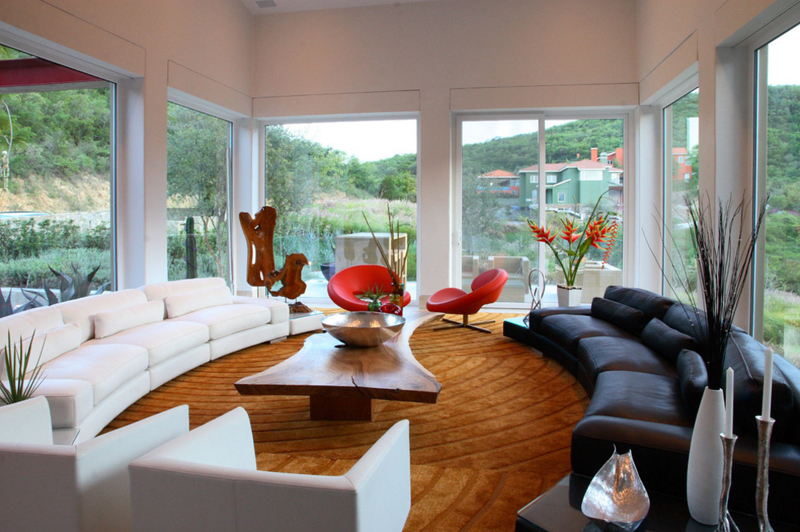 The curved couch is a great contrast to the square shaped carpet and living room. 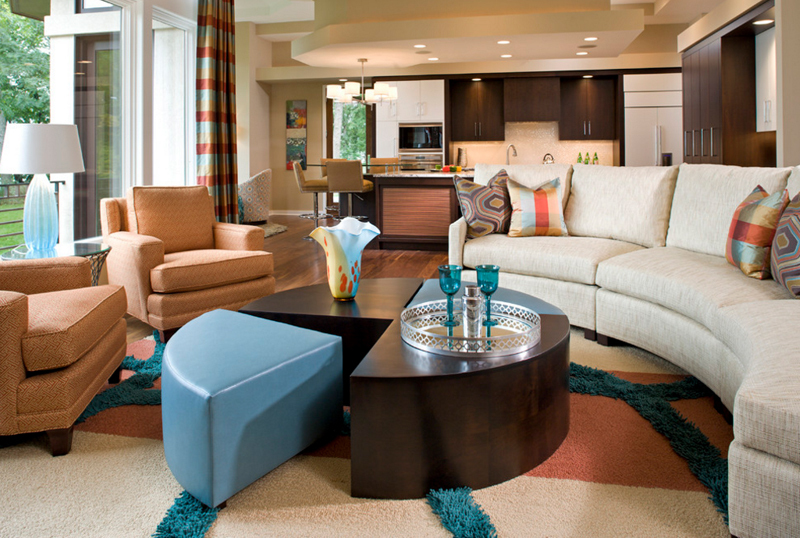 By putting those single chairs around the circular coffee table is a nice, creative touch forming a round living room. 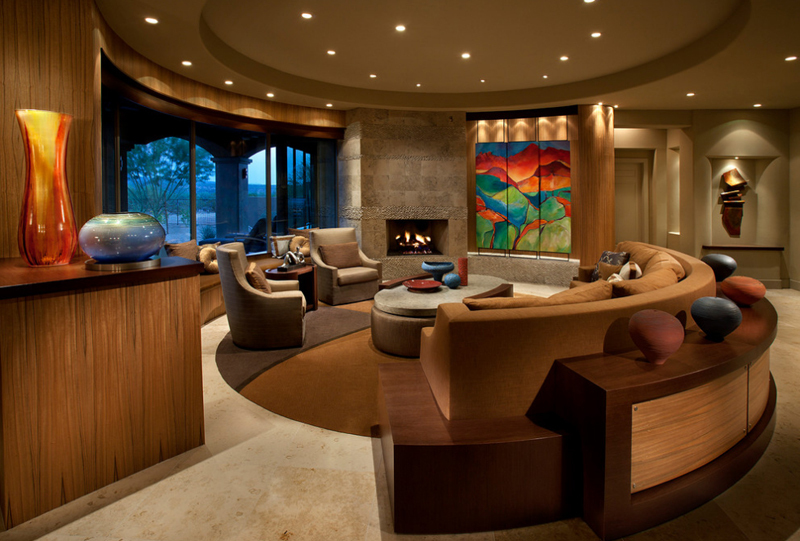 This residence has curved walls as part of the design and small curved couches along with a pair of lazy boys are a good idea to make the cozy living room a lot cozier! 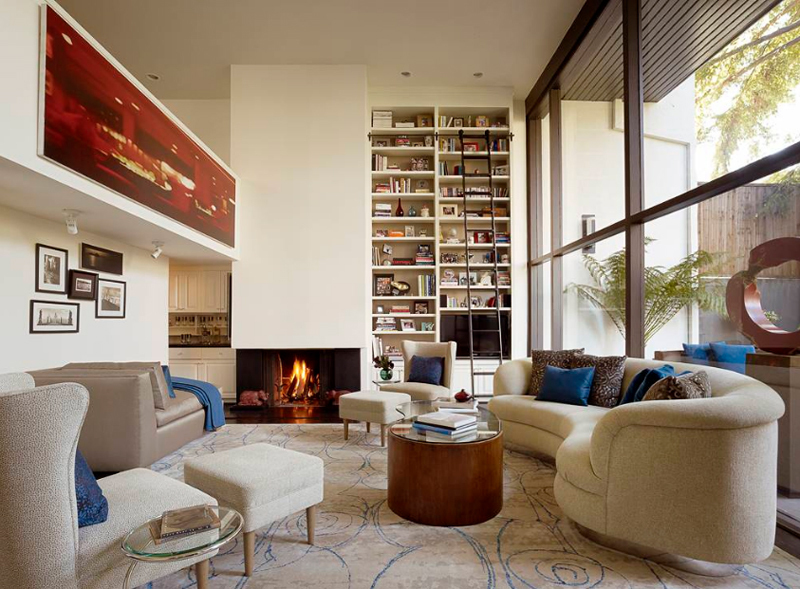 Not to mention that the unique fire place is a good idea for an addition in a modern living room like this one. Furthermore, the view outside is a winner so tall glass windows are great for the living room. The rectangular floor space is nicely contrasted by a perfect semi-circle couch. The colors and decors in this living room are all unique and to an extent, have an eclectic feel. The chairs are corset-shaped, the framed paintings and decor have fresh, vibrant colors to it. In general, this room is definitely cool and kicking! 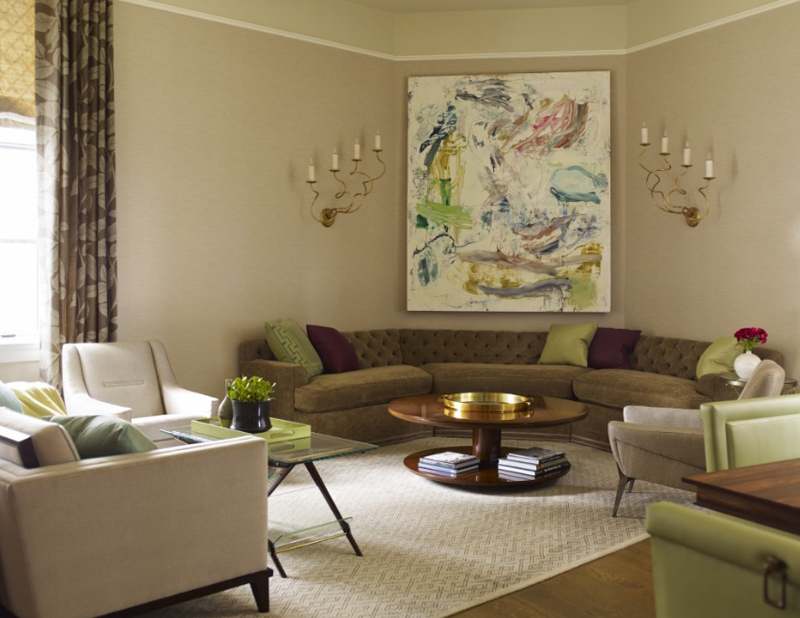 The different shades of brown used in this living room beautifully meld with each other. 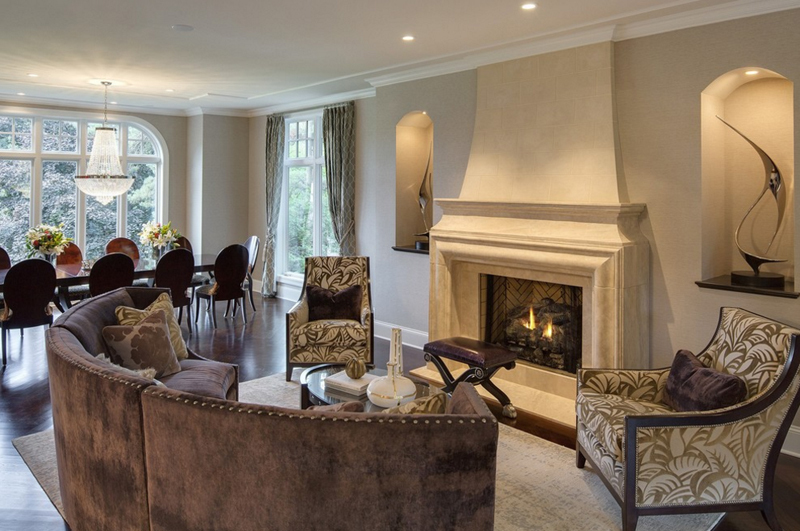 The fusion of the colors work really well in making this living space very elegant and classy. The curved couch on top of a beautiful wooden elevation is very fancy. The various vases in this room are also great add-ons to this splendid room. The curved couch and nice decors in this room make the room really unique. Although not a lot can occupy the couch, its beautiful color fuses well with the whole look of the room. The carpet, curtains, and the walls all nicely infuses together that earthy yet homey feeling to this space. This home has beautifully incorporated the grays and silvers together. 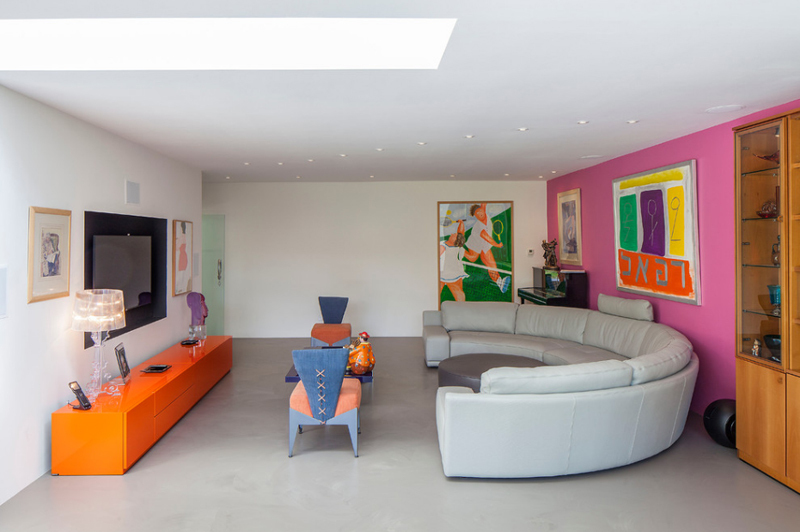 With minimal orange and red accents, the whole look of the house particularly the living room is modern and fancy-looking. The design of the unique couch has double purpose. So whether you are on the living area side or in the billiard table side, this couch is there to make you feel comfortable. The living room is small and sweet. The curved couch is perfect for the shape of the wall in this particular space. The olive green color is a good color to easily mix and match with. There are a few decors, nonetheless, they work nicely in this space. As usual, carpeting is a nice way to make divisions or partitions within the home. Curved couches are perfect for any type of home. Whether it’s a penthouse, a townhouse, or a house by the coast, curve-shaped couches are a good addition to consider for your living room. If you are not really a fan of regular-shaped couches in the home, why not try curve couches and see if it works for you? 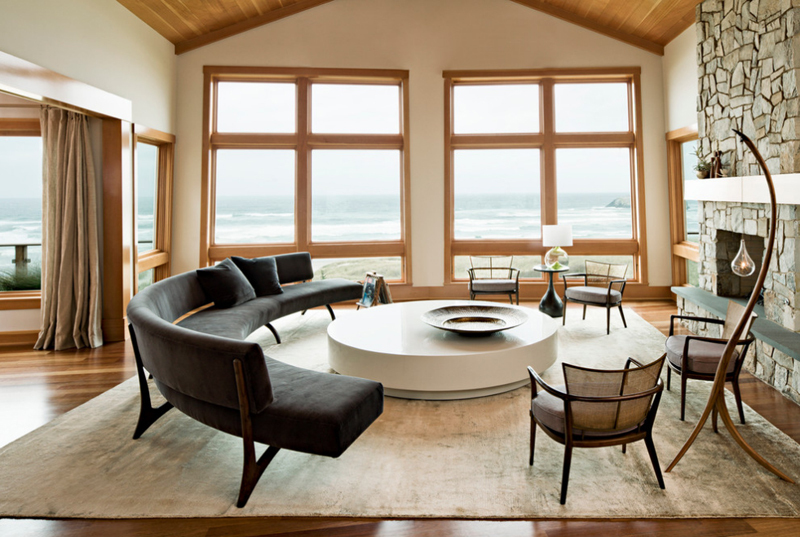 As made evident in this list, curve couches add a zing to the home. Also, you might want to check this list of15 Curved Modular and Sectional Sofa Designsand get some inspiration too.